On the morning of the resurrection there were lots of emotions and confusion. Some awoke that morning not knowing where to go next, what to do. They had invested 3 years of their lives in what now looked like a pipe dream. It had all vanished when Jesus died. Some, however, knew exactly what to do. They didn't have time to figure out the secrets of the universe or to try to understand the whys. They just needed to be at the tomb, to find a way to demonstrate their love. Mary Magdalene was one of those. Early in the morning, just as the sun began to glow in the east, she made her way through the dawny darkness to the unfamiliar place where Jesus' body had been hurriedly placed. When she arrived she looked around, unsure if this was the right place. The big stone that had blocked the entrance wasn't where she saw it last. A million thoughts rushed through her head as she tried to put the pieces together. Instantly it came to her - someone moved His body! She rushed back to the only person she could think of who would do something - Peter! He might not know WHAT to do, but he would do SOMETHING! Peter called to John and together they dashed toward the tomb, arranging their clothing as they went. The younger John rushed ahead of Peter but his youthful zeal evaporated at the edge of the darkened cavern. He wouldn't go in there alone, but Peter barged right in, hoping the catch whoever it was in the act. Amazingly what they saw was not the signs of a grave robbery. There wasn't a heap of disheveled burial cloths, but instead everything was neatly in place - except there was no body. The face-cloth was folded neatly and gently placed aside, almost as if someone had caressed His face ... and then ... what? They didn't know. Confused, dazed, bewildered, each disciple went back to his house. John believed that Jesus had risen from the dead. Peter just wasn't so sure. He just didn't know. Mary couldn't leave. She just couldn't. It was fine for others to leave, but this place was the last connection she had with Jesus and even if His body wasn't there any more, she had to stay there to weep. To mourn. Her love formed droplets of tears as they ran down her cheeks and dissolved into her clothing. 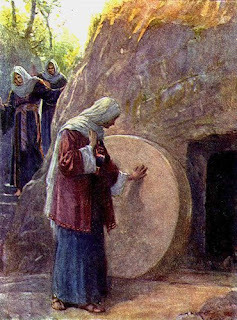 She ventured another look into the tomb and this time she saw two angels in white sitting where Jesus had been lying. They asked her why she was crying and in her grief she was too upset to question why angels would be there. She poured out her heart - "they've taken my Lord and I don't know where!" As she spoke these words she heard a rustle behind her and saw the angels' eyes look past her, as if someone had come in. She turned and in the darkness of the tomb looking into the bright opening she saw the outline of a man, perhaps the gardener. He said, "Ma'am, what's the matter? Who are you looking for?" Angry that perhaps this was the one who had disturbed her Lord's resting place she blurted out, "If YOU have taken Him somewhere, just tell me. I'LL go get Him and take Him off your hands. It won't be a bother, just tell me!" Just then the Gardener opened His mouth and with the tender love that she had first heard from His voice so long ago He simply said, "Mary!" She knew! She knew!!! It was Him! It WAS Him! Emotions flooded her soul, her mournful sobbing deepened into sobs of relief and joy and she lost all decorum, flinging herself at Him, clutching at Him, holding His head in her hands in disbelief and then clinging to Him so tightly she could barely breathe. It was Him! He had been there. She just hadn't seen Him. She just hadn't recognized Him. But He had been there. He gave her a message, told her of things to come, made her the first evangelist of His resurrection and sent her to tell the others. He called her name. As I read this familiar story I was brought into the complex web of emotions and truly sensed the wonder of the morning. I also was captivated by the fact that Jesus stood there but she didn't know it was Him. How many times in our lives have we felt all alone, completely bewildered and confused - and He was there all the time? And when He calls our name - oh what joy, oh what peace, oh what comfort! Today I hope you're encouraged that no matter what's going on in your life, He is there. You may not recognize Him. Your darkness may obscure His form. Your grief may prevent you from recognizing Him. But His is there. And all you need is to hear Him call your name. So pour out your heart. Don't hold back. Tell Him why you're crying and Who you're looking for. And listen for Him to call your name. He's there.